We’ve all heard of the big bad Cancer. There are many types of cancer, and cancer – which is an abnormal growth of cells somewhere in the body – happens for a variety of reasons. One main reason is that the immune system fails to kill a cell that is growing out of control. One very important job of the immune system is to monitor growth cycle of cells throughout the body, and to make sure things are happening as they should, in a process known as homeostasis. One way immune cells can communicate with other cells is by touch: they basically ‘hug’ other cells in the body to check-in and make sure those cells are young, healthy, and not infected with bacteria or a virus. This is called an immune ‘checkpoint’, and is an important way that immune cells can identify good from bad in the body. When an immune cell touches a cancer cell, cancer cells will sometimes put up a flag that says “Everything is fine”, tricking the immune cell to not destroy it (the cancer cell) or sound an alarm. Over time, one cancer cell can divide until there are many cancer cells, which can become a tumor (the exact process depends on the type of cancer). At this point, the cancer cells are all lying to the immune system by telling it ‘everything is fine, nothing to see here!’, and the tumor is continuing to grow. In fact, cancer cells often grow much more rapidly than non-cancer cells, taking vital nutrients and even developing their own blood supply to more quickly receive those nutrients. Cancer is typically treated by an oncologist, (a cancer doctor) who recommends chemotherapy and radiation therapy. Chemotherapy is essentially poison, and is designed to kill rapidly growing cells and hopefully do less damage to healthy cells that don’t grow as fast. Radiation therapy uses high doses of radiation to shrink or kill tumor cells by damaging their DNA. A cancer cell with damaged DNA cannot divide or grow, so it will eventually die. Both therapies are designed to target cells that are growing rapidly, with the idea that those cells will also die faster than normal cells. However, these treatments affect both cancerous and non-cancer cells. The damage to the non-cancer cells can cause side effects that are sometimes extremely painful and/or permanent, including hair loss, nerve damage, and damage to other tissues in the body. Scientists have begun to use the immune system to target cancer cells by blocking the ‘everything is fine’ signal, a treatment method called ‘immunotherapy’. CTLA-4 and PD-1 are two of the main ‘everything-is-fine’ flags (immune checkpoints) waved by cancer cells. Scientists tried to see if they can boost the immune response by blocking these flags. The idea is that if they can block one of these flags, the immune system will see the cancer cell and go “Wait a second…you’re BAD! Time to die!” instead of not responding. Fortunately, this seems to be working! It turns out that when these signals are blocked with checkpoint inhibitors, the immune system can identify cancer cells and will kill them. 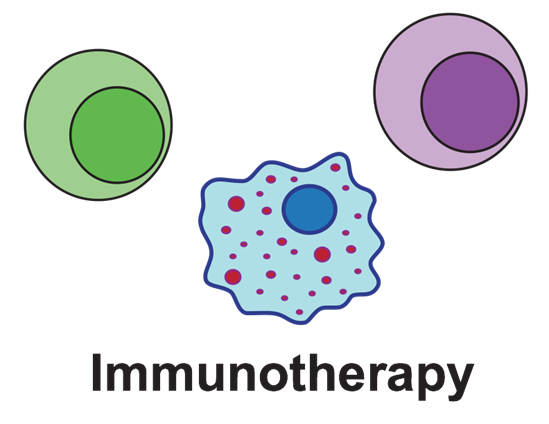 One great thing about immunotherapy is that doctors are using medication are able to specifically target bad cancer cells with a patient’s own immune system. Another bonus is that immunotherapy has fewer side effects than chemotherapy, but it still carries a large risk: these drugs block the ‘everything-is-fine’ signal from all cells in the body. When the immune system starts to fight and try to kill healthy cells (where everything really is fine! ), patients can get really sick and in rare cases have actually died. The huge success of these projects has opened up a whole new field of targeted immune therapies. These will only continue to improve as scientists learn more about the immune checkpoints in different types of cancer, and are able to harness the immune system to be a specialized fighter (ideally with even fewer side effects). In fact, the discovery and development of these checkpoint inhibitors was such an incredible scientific feat that Dr. James P. Allison (at MD Anderson Cancer Center in Dallas, TX) and Dr. Tasuku Honjo (at Kyoto University in Kyoto, Japan) received the Nobel Prize in Physiology or Medicine last year for their discoveries of CTLA-4 and PD-1, respectively. While these therapies need a lot more research, they have already saved hundreds of lives, and sure are a great start to harness the power of a patient’s own immune system to better fight and kill cancer, before cancer can kill the patient.